CueApp is an app for iOS and Android. It is primarily intended to be used by camera operators, but it can be a helpful tool for all team members. During each act, all devices running CueApp are synced in realtime to the CuePilot Studio Server which executes the performance exactly as planned. CueApp enables every studio crew to work with a higher degree of precision than ever before. 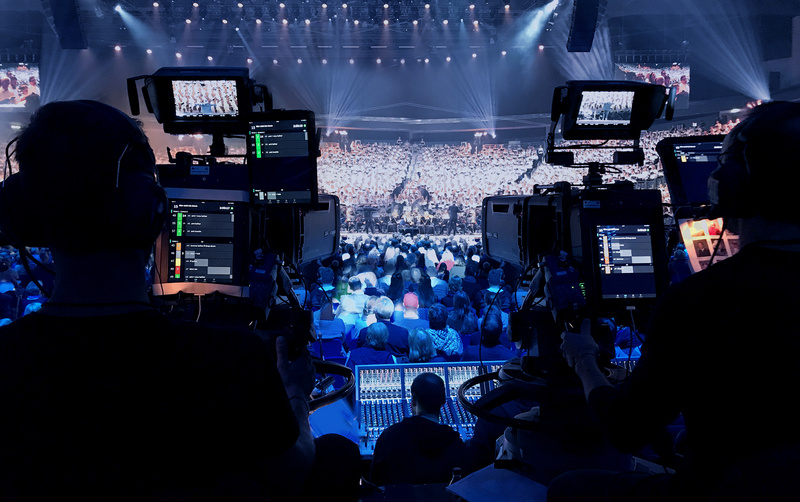 The camera operators will know exactly what happens next and when they are on: Each user gets a personalized view, with individual information about his or her next shot or cue - including a visual and audio countdown - ensuring a higher accuracy and efficiency in rehearsals and production. Using CueApp, each camera operator and other members of the team can view and rehearse every act, as many times as they want - no matter where they are, even from home. Users can write personal notes for each shot, and view videos from rehearsals, synced to the playback in CueApp, and this way get a complete sense of the details and timing of each shot or cue. With the simulator below you can test CueApp and get an impression of how the app is used, and how it helps keeping the whole production in perfect sync. Just tap the the CLOUD button to open a Demo Project. After selecting a Rundown and an act, you can select a video for the specific act in the lower right corner. CueApp 3.2 is availabe for both iOS and Android, and will work on all different phone and tablet sizes - from the smallest iPod to a large iPad Pro, and on all Android phones and tablets. You can download CueApp for free on the App Store and on Google Play.